Poetry and medicine: Rafael Campo and why doctors need the humanities. Textbooks and articles about facing death don’t capture the essence of the experience the way poetry does. 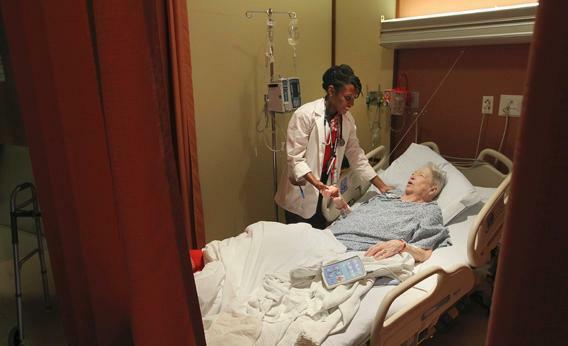 Pictured, a Boston University Medical student and a patient at the Boston Medical Center. Rafael Campo, an associate professor of medicine at Harvard, just won a major international prize. It wasn’t for his excellence in internal medicine, or his decades of teaching, or his scholarship. It was for a poem. Poetry often seems the least practical endeavor on Earth. It’s a smattering of words on the page, often with minimal form, story, or logic. It doesn’t earn money, build cities, cure illness, feed the hungry, or solve the pressing problems of society. But sometimes it is the things we deem least practical that wield the most power. In fact, poetry’s impracticality may be its strength. By being just words on a page, it isn’t expected to pull the weight of chemotherapy, antibiotics, or an MRI machine. So when a poem does pack a punch, we’re often bowled over. For those of us faced with the challenging task of teaching—or preserving—empathy with the next generation of doctors, this experiential definition of empathy nails it in a way that no PowerPoint lecture could. Given our knowledge about the battering that empathy takes during medical school, such experience is crucial. Forgive me, body before me, for this. So opens Campo’s prize-winning poem, Morbidity and Mortality Rounds. It’s an immersion into the maw of death. I’ve read textbooks and articles about facing death, but they don’t capture the essence of the experience the way these few lines do. Every doctor and nurse will recognize “when I look at you, I see myself laid bare.” It’s the fierce existential tie between caregiver and patient. Poetry and humanities are beginning to flower in the medical world. Many medical schools, such as Mount Sinai, are devoting resources and time toward the humanities. Journals such as the Bellevue Literary Review (for which I’m the editor-in-chief) focus on creative interpretations of medical challenges and vulnerabilities. It is increasingly apparent that doctors and nurses need the creative skills that the humanities offer to be effective and wise caregivers. because the cancer has to be removed. and yet whose cruelty was obvious. sleep too, beside you under the same moon. for losing you, unable to forgive.